At least from the time of Jesus, and for possibly 1,500 years before, the Anasazi occupied a huge chunk of mostly arid and barren real estate in the Four Corners Area of the American Southwest where four modern states – Colorado, New Mexico, Arizona and Utah – join at one point. Many 19th century archaeologists believed that the Anasazi disappeared after they abandoned major cities like Mesa Verde and Chaco near the end of the 13th century. Now, we know that they didn’t just vanish into thin air, but migrated to the Río Grande Valley, Hopi, Zuni, Acoma and other pueblos in Arizona and New Mexico. (See the SW Cultures Map). In fact, modern scientists have extended the historical timeline of the Anasazi to at least 1700 and, often, right up to the present to encompass the modern Puebloan descendants of the Anasazi. Scattered throughout the immense area once occupied by the Anasazi are hundreds of thousands of sites, ranging from caves and individual campsites in the open to multi-story adobe pueblos and magnificent cliff-side stone cities. Most of the major sites are within the boundaries of national or state parks and monuments. On the following pages we deal mostly with such major sites since they are generally more accessible and better maintained. The area of primary Anasazi occupation, as shown on the SW Cultures Map, overlaps with areas occupied by other ancient Southwest cultures, including the Mogollon, Hohokam and Hakataya. In the following pages we focus on the purer, non-overlapping part of the Anasazi territory, bounded on the south by a line running roughly from Flagstaff, Arizona, to a point about 50 miles south of Albuquerque, New Mexico. 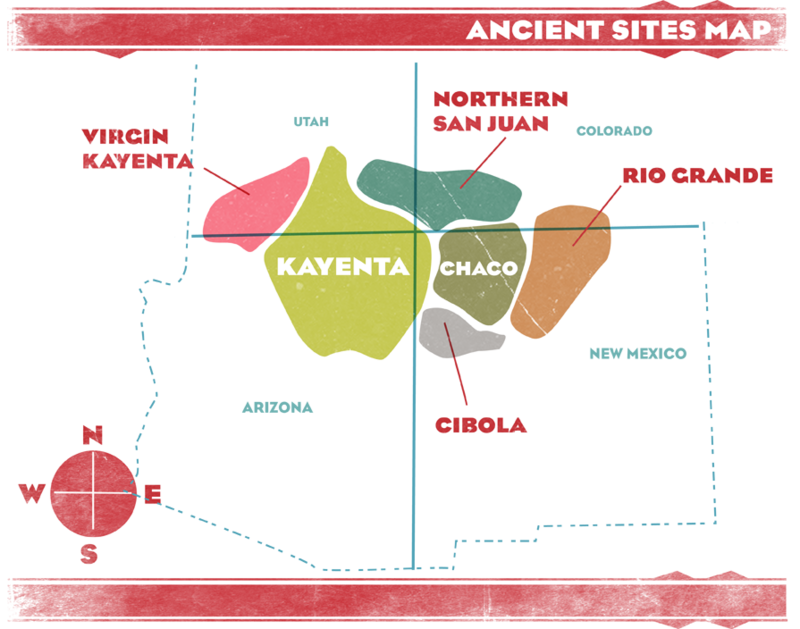 Modern archaeologists break this area of Anasazi cultural influence into six distinct districts or regions: Chaco, Northern San Juan, Kayenta, Virgin Kayenta, Cíbola and Río Grande. 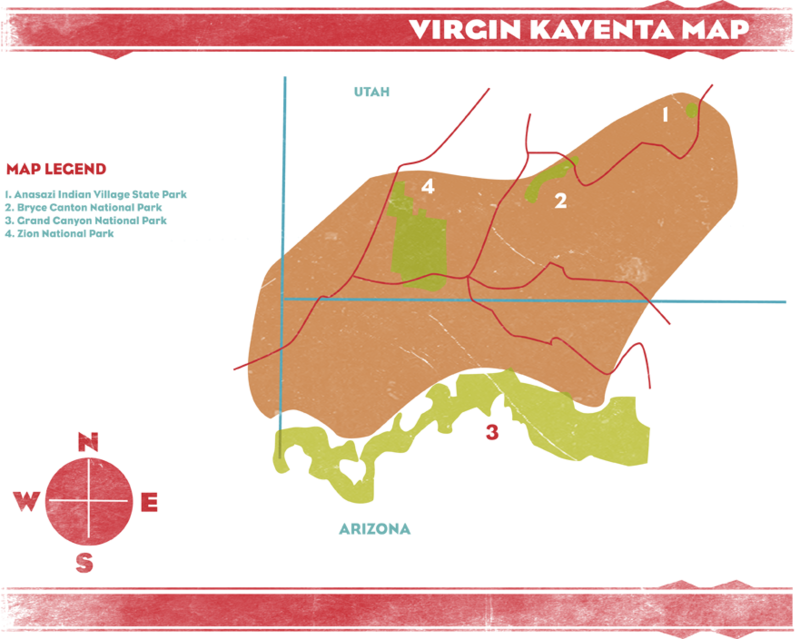 (See the Ancient Sites map). The Chaco Region is located in the northwest corner of New Mexico and centered on Chaco Canyon, the area of probably the highest level of societal and cultural development of all the Anasazi regions. 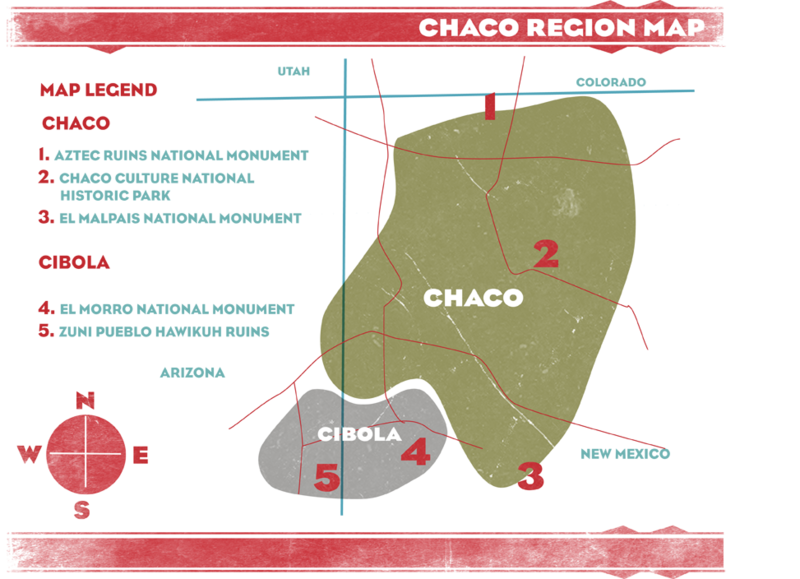 (See the Chaco Region Map). The Northern San Juan Region, sometimes called the Mesa Verde Region, occupies the southwestern corner of Colorado and the southeastern corner of Utah. 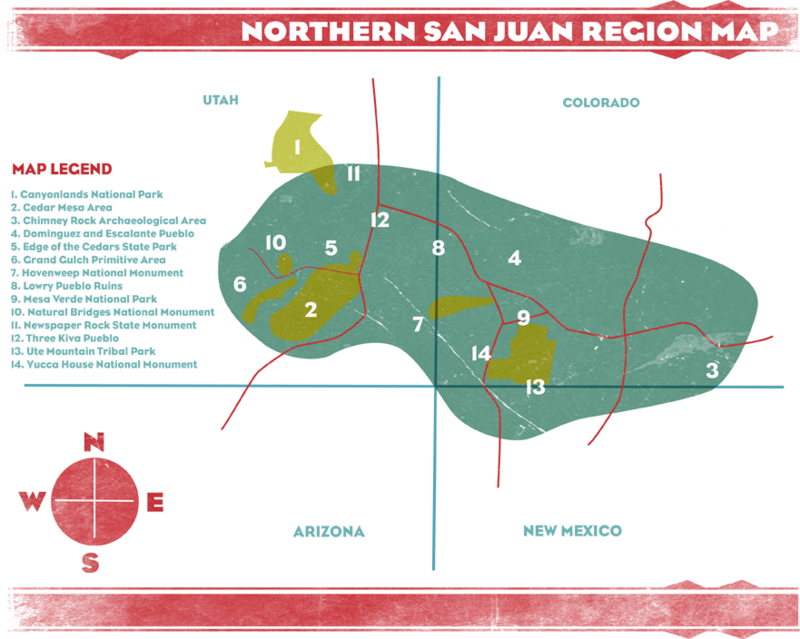 (See the Northern San Juan Region Map). Included in this region are America’s best-known Anasazi ruins at Mesa Verde. Largest of the Anasazi regions, Kayenta spreads across northern Arizona into southern Utah and northwestern Colorado. Some researchers identify the western part of the Kayenta Region as the Virgin Kayenta. The Virgin subregion stretches from the midpoint on the Utah-Arizona border west to a point about 40 or 50 miles into Nevada. Bounded by the Grand Canyon on the south, the area is named for the Virgin River, which originates in southwestern Utah and joins the Colorado River in Nevada. 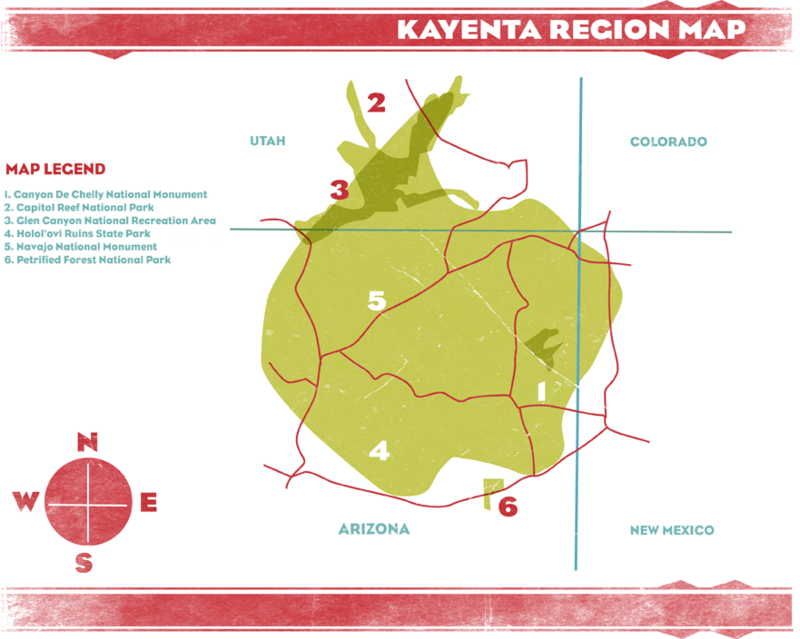 (See the Virgin Kayenta Region Map and the Kayenta Region Map). Straddling the Arizona-Utah state border at a point in line with Winslow, Arizona, on the west and Albuquerque, New Mexico, on the east, Cíbola is by far the smallest of the Anasazi regions. Centered on the existing Zuni Indian Reservation, it includes El Morro National Monument, which contains the remains of Anasazi culture. 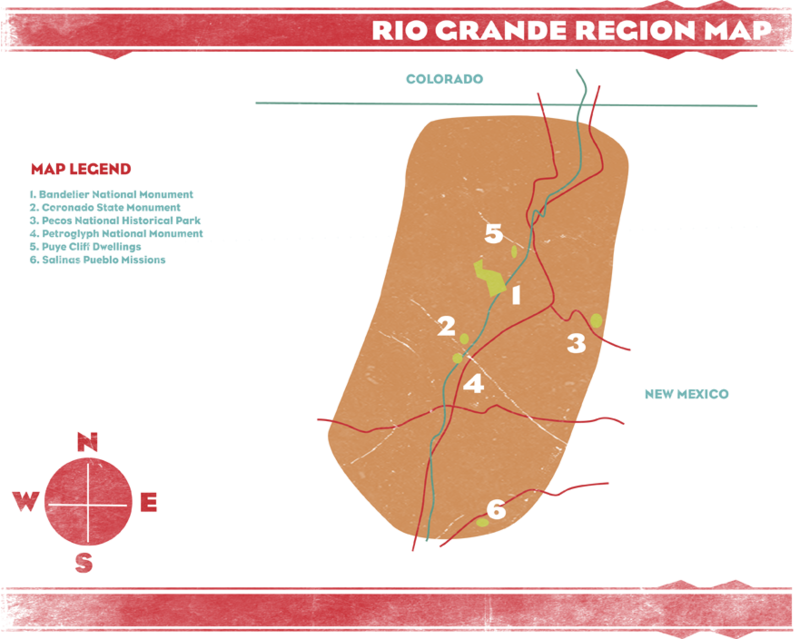 (See the Cíbola Region Map). Seventy to eighty miles wide and straddling the river for which it is named, the Río Grande Region lies entirely in New Mexico. It reaches from a point about 25 miles south of the Colorado border to a point about 50 miles south of Albuquerque. (See the Río Grande Region Map) With the exception of Hopi, Zuni, Acoma and Laguna, it encompasses the majority of the present day homes of Anasazi descendants, including the 14 Río Grande pueblos.